Deer are everyone's favorite large woodland mammals. Elegant, graceful, and omnipresent in the northern woods, their foraging habits sometimes take them into our backyards to nibble on our plants. If you're not keen on blowing Bambi's brains out with a shotgun (which we do NOT advocate), try planting one of many deer-resistant plant varieties carried at Whispering Hills. 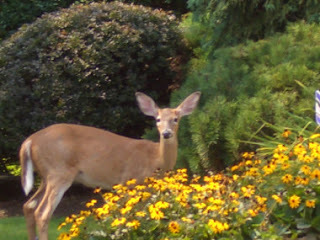 Below you'll find lists of trees, shrubs, perennials, vines and flowers that DOE'nt attract deer. Click here for a list of of deer-resistant vines, flowers, and groundcovers.